Today as we celebrate the Feast Day of our National Patron Saint, we may may be feeling slightly sorry for ourselves given the seemingly unending snowfall even managing to stop the Cardiff St. David Day parade. We have been expecting the snow for a few days as it has approached from East having visited the warmer climates of places like Rome. Anyone who is a keen user of Social Media, and especially Facebook, will have seen the short video recordings captured on St. Peter’s Square on Monday as seminarians from the North American College went to war with seminarians from our own Venerable English College (VEC) in a snowball fight. 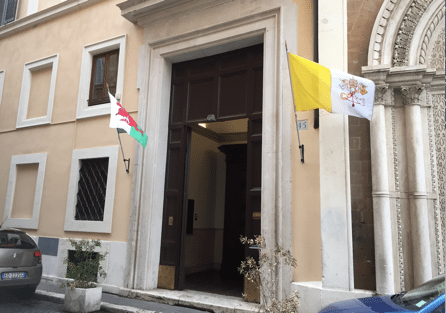 Well today the snow has cleared in Rome and we have been sent a nice picture of the exterior of the VEC to warm our hearts this exceptionally cold St. David’s Day as the Welsh Flag flies proudly alongside the Papal Flag (see picture). This brief note is to wish you a happy St David’s Day and to assure you that the Welsh flag is being flown here today, as it is every year on this day, together with the Papal flag! I took the photograph, pasted below, just a few minutes ago. Professor Whitehead is charged with looking after the College archives that are significant for the history of the English and Welsh Catholic community. Notably for Wales the Welsh Martyr, St. David Lewis, spent time at the college in formation for the priesthood before returning to these shores in Reformation times and ultimately sacrificing his life for the sake of his Catholic Faith and ministry. We thank Professor Whitehead for his kind message from Rome and wish him and everybody at the VEC a hearty Dydd Gwyl Dewi hapus! Cornerstone appoints poet in residence Fr. Jimmy Thomas R.I.P.